Bright, beautiful 3 bedroom family house, only 5 mn from the beach. Ideally located in the heart of Cadaques, the most exquisite village on Spain’s Costa Brava. This is a bright, beautiful and spacious 3 bedroom house in the centre of town, only 5 minutes walk from the beach and all the seaside cafes and restaurants. The main living area is a fantastic double-height space with large windows opening to a balcony, with views of the mountains (and a bit of sea). The top floor is an open mezzanine with a separate lounge area. There is ample built-in storage throughout the house. There are two double bedrooms on the first floor, one with a double bed and the other with 2 single beds. The third bedroom is slightly smaller with 2 single beds and an en suite bathroom with shower. There is also a complete bathroom between the two main bedrooms and a separate wc on the main floor. You are welcome to bring your own linen and towels. If you prefer, we can provide it for you: bedlinen is available at 10 € per bed set, and 6€ per set of towels. The balcony has a table and two terrace chairs and is great for breakfast or a quiet drink at sundown. So happy to hear that you enjoyed your stay! 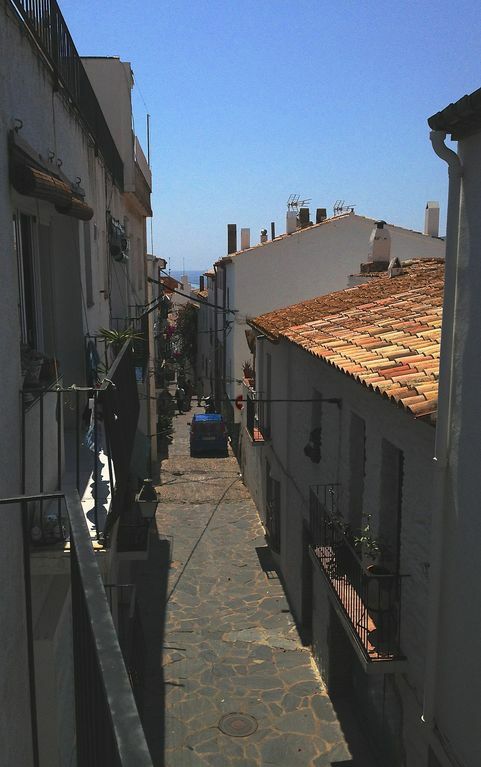 Cadaques is indeed amazing, I'm glad we could help you discover it. Thanks for the review!! The house is very close the beach, the city center with restaurants. The property clean is correct. The garage is very helpful for a city as Cadaques. Nevertheless there were some slight inconveniences : lack of awning on the main (and south) face of the house causing an hot inside ambiance in the after noon...Small leak on the water tap in the kitchen. Not a lot of hot water in the bathroom (but it wasn't a problem in the heart of the summer in Cadaques ! ).At least, it is very important to know that the house is on four level, so there are a lot of stairs... Despite these small inconvenience, I fully recommend this house ! Thanks so much for your feedback, I'm very pleased that you enjoyed your stay and would recommend the house! This summer's heatwave was tough for everyone and I'm sorry to hear the curtains were not enough - sometimes we can have too much of a good thing! As for the hot water in the bathroom, I wish you could have let us know as it is very easy to just adjust the thermostat on the main water heater to have more hot water for all. Thanks again for your recommendation!! We had a great stay in this apartment. It is very large - 4 floors. There is a great loft with couches and a sitting area that my teenage son took over as his own space. Its a 3-5 minute walk into town and the beach area. Be aware that this town is built on a mountain side so the walk from the apartment is down hill and returning home is uphill. There is a garage included with this apartment which was great for our rental car. the apartment owner, Viviana is very accessible and responsive to answer questions. She also has an onsite manager, Kikse who is wonderful and responsive. The Wi-Fi worked well and was fast enough to handle 4 people using it at the same time. I gave the owner a little feedback about peeling paint in a couple of areas and she was very open to the input. I forgot to let her know that a few beach towels were needed. You might want to bring your own. We rented an inflatable boat and Scooters while we were there from "Cadaques Rents" this was a very positive experience. The owner is great. I recommend both of these rentals. If you are a cat lover, be sure to visit Gabriel and her cats located next to the church on the hill. Hi Erin, thanks so much for taking the time to write such an extensive review - it's great to know you had a really good time in Cadaques, and enjoyed staying at the apartment. Thanks also for the feedback about the paint- it's already been repainted and as good as new :) and beach towels are a good idea! Had a wonderful few days staying here in Cadaques last December. The house was clean and is just as in the pictures, it was very comfortable and the location is great, very central and within walking distance of everything. There are two separate lounge areas, which was just perfect as the kids had their own space upstairs. It's not luxury accommodation but it's all perfectly appointed and has all you need to spend a nice relaxed few days. The owner was super friendly, everything went smoothly and efficiently. We really enjoyed the stay and would definitely come again. Cadaques can be easily reached by car, taking the exit towards Figueres off the AP7 motorway, then driving on towards Roses and Cadaques. There are interurban buses linking Cadaques to all the other towns in the area, and direct buses from Girona and Barcelona. Cadaques, barely a couple of hours North of Barcelona, is a jewel of the Mediterranean, pretty as a picture, buzzing in summer but without being brash, with just about the best seaside cafes, breathtaking views, cute winding streets, and clear blue waters you could ever wish for. Salvador Dali, who used to hang around the place a lot, said it was the cosmic centre of the world, and so it has remained to this day. (You can visit Dali’s house in Port-Lligat, it’s a 20mn walk from the house). Cadaques has a lively art scene with lots of galleries and exhibitions throughout the summer, and - lest we get too high-cultural - plenty of shops too. And seafood to die for. And great for scuba-diving if you're into that kind of thing. From Cadaques you are just over an hour away from Perpignan in France, and it’s also a great base from which to explore the coastline and the interior, with gorgeous small towns like Carcassonne, Collioure and Ceret on the French side, and Besalu, Port de la Selva and Empuries on the Spanish side. Girona, with its wonderful Old Quarter, is about one hour’s drive to the South. Please note that unless agreed otherwise, arrival on changeover days is at 4pm (16h). Departure is latest at 11am. For arrival later than 10pm (22h), we charge an extra 20€ If you would prefer to bring your own bedlinen and towels, please let us know and we will adjust your quote accordingly. Thank you! Downpayment requested. Security deposit requested. Key pick up with owner.